The painting captures well the chaos of the scene as described by Tacitus. We can see the variety of brawling going on. Some of the stick figures are holding weapons, others appear unarmed, some are clearly throwing stones, and one figure down in the bottom right seems to be heaving a large stone or marble block. And in the middle of it all stands the Pompeian Amphitheater, the source of all the trouble, with its signature double flight of stairs and tall arches. Some of the graffiti that mentions Actius also includes the name “Castresis,” leading to della Corte’s conclusion that they are the same man. Three inscriptions possibly mentioning Actius are found on the facade of 1.3.23, providing the basis for della Corte’s identification. The further identification of Actius as an ex-gladiator comes from a combination of the name “Castre(n)sis” (lit. “the Campaigner”) with the presence of this magnificent fresco of the amphitheater riot in the house. It doesn’t take Franklin very much ink to rip apart della Corte’s reading of the graffiti outside 1.3.23 and his identification of Actius with Castresis.5 He leaves untouched, however, della Corte’s assumption that the amphitheater fresco shows that the resident of 1.3.23 was an ex-gladiator. Is that really the only reasonable explanation for the presence of this mosaic in a private home? 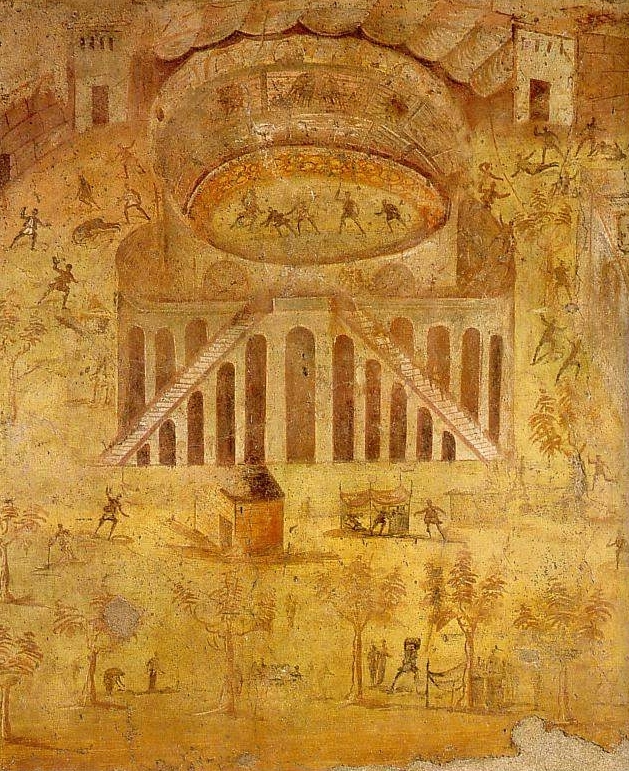 If the owner of 1.3.23 were an ex-gladiator, it is curious that of all the possible scenes involving the amphitheater that he could have chosen to have painted, he chose a scene, the riot of 59 A.D., which doesn’t actually include gladiatorial combat. Certainly the riot wouldn’t be the most prestigious moment in a Pompeian gladiator’s career. Furthermore it has been suggested by scholars that the event at which the riot broke out was not actually a professional gladiatorial show, but rather something like a mock fight between youth organizations that provided military training for young upper class men.6 Although it is always difficult to maintain an argument from absence in archaeology, nevertheless the identification of the house as the home of an ex-gladiator would be easier to defend if the house also included paintings individual gladiatorial scenes (consider, for example, the gladiator mosaics on display in the Galleria Borghese in Rome). As it is, any extrapolation of the owner’s occupation from the amphitheater mosaic is little more than mere speculation. I would like to propose instead a more general motive for someone to paint a fresco depicting the riot of 59 A.D., namely the event’s importance in the local history of Pompeii. As Tacitus tells us, this seems to have been a rather serious riot. The number of casualties, both dead and wounded, was significant as we can tell from Tacitus’s emphasis on “multi” and “plerique.” For judgment the matter was referred directly to Rome itself where, after the consuls had declined the case, it was heard by the Senate itself. In punishment, the Senate banned events of the type that led to the riot (whether that means all gladiatorial shows or something more limited is a matter of scholarly debate) for no less than ten years, dissolved certain Pompeian organizations, and exiled Livineius Regulus and other powerful local politicians. For a town the size of Pompeii, such a major direct intervention in local affairs by the imperial government in Rome would have, to put it succinctly, been considered a big deal. It was quite common for Romans to decorate their houses with frescoes depicting dramatic events from mythology, epic, or history. In terms of local history, the riot of 59 classifies as a dramatic event, a little piece of local epic, and certainly worthy of a wall decoration.